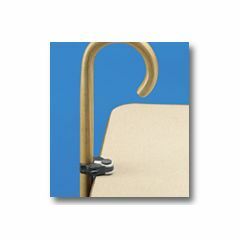 This unique holder clips onto the cane and uses friction so it can hang from the edge of any table, desk, or counter. GREAT Idea. A true inspiration. This is a great idea.Kudo's to the inventer of this product! Holds cane in place. Convenient. Frees up both hands. Checkouts and counters. Household areas. I'm not picking up my cane all the time anymore. This little gadget is a big help. This is great if you are dropping your cane and can't bend over to pick it up without getting unbalanced. Now if they had one for keys . . .
Small and stays on cane. Small and stays on cane. Cane still falls easily . Compact and stays on cane. Had it 2 days-popped off. Easily pops off-2 days us. This cane holder was put on by my Dr.It looked O.K. but it popped off 2 days later without me realizing it. Doesn't stay on well. How wide do the pads open? I have 2 canes each with a holder attached. One is 3/4 of an inch in diameter & the other is 1 inch. I use them all the time. Each clip will open to accomodate a 1" diameter tube. 3/4" would work ideally. 1/2" fits loosely and there's no easy way to adjust the clamps for a smaller size.